Vaughan Azzurri demonstrated the quality of their roster depth in Kingston on Saturday evening, crushing the hosts 7-nil and returning the club to the top of the League1 Ontario standings. 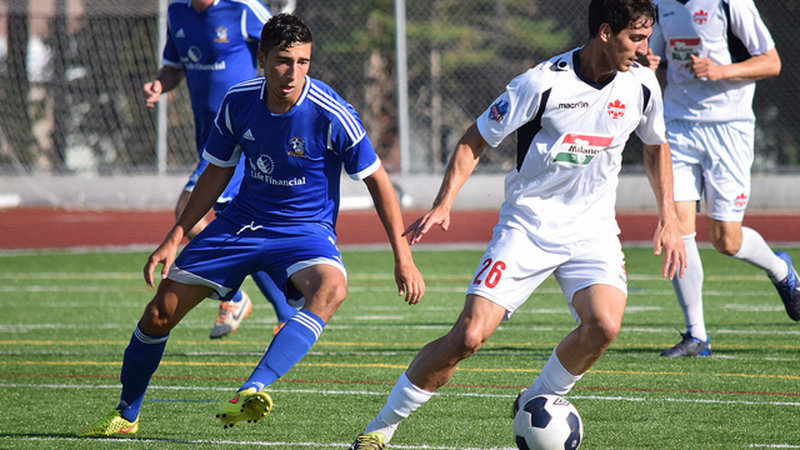 The Azzurri rested a number of regular starters in light of their Ontario Cup semi-final on Sunday, but still brought an impressive array of attacking talent to the contest. Veteran players Andrew Ornoch, Joseph Di Chiarra and Paulo Alves anchored the side - Ornoch and Di Chiarra each scoring a brace - but youth products Darren Gertiesingh, Owen Pearce, Omari Morris and Casey D'Mello, in particular, made outstanding contributions on the day. Playing a 4-2-3-1, with Ornoch leading the line and Morris, Pearce and Gertiesingh arranged behind, Azzurri's attacking movement overloaded the central zone of Kingston's 4-4-2 - manned by a pairing of player-coach Jason Massie, and Dylan Kirk. Within three minutes, Gertiesingh began to give Kingston right back Boris Baker nightmares, slaloming in and out of the the outside and inside left channels before centering for Ornoch, who laid off for Di Chiarra's clinical strike to keeper Navi Sidhu's top right. Kingston responded quickly with striker Tim Campos coming deep in midfield to collect a pass from defence, turning and splitting Vaughan's defence with a through ball for the onrushing winger Joel Zelt - who would continue to be a bright spark for the Clippers - but a perfectly timed tackle by Vaughan's right back Casey D'Mello ended the threat. Vaughan began to effectively dominate the ball after the opening ten minutes, creating one touch passing moves, and overlaps from fullbacks D'Mello and Malcolm Loukides. Calm passing from central defensive pair Paulo Alves and Faraji Assaroui calmly initiated many of the moves that would end up in the Kingston net. Such a move in the eighteenth minute resulted in Gertiesingh going clear in the left channel, again winning his 1v1, cutting the ball back for a dummy from Ornoch, and a slick right-footed grasscutter from Di Chiarra to double his tally. Kingston sought to bypass the troubles in midfield by going direct to Campos and strike partner Robbie Murphy, but Azzurri greatly outumbered the front two, won the majority of aerial challenges and knockdowns, and sent wave after attacking wave back at the Clippers backline. As such, pressure gradually increased in the Kingston defensive third, causing errors in possession that led directly to goals from Pearce and Di Chiarra in the twenty-third and thirty-fourth minutes. Clippers would manufacture a set-piece chance on twenty-nine minutes, as Kirk would nod a chance agonizingly past the right post from a Massie corner, but halftime found a despondent panel of Kingston men four-nil down and restricted mainly to a small number of chances from distance. A re-jig of players to start the second frame led to a period of optimism from Clippers, as Joel Zelt replaced Kirk at centre mid, and sub Omolade Ogunsanya occupied the left of midfield, both adding attacking verve and zest. Ogunsanya finished a rebound from a Zelt shot that Vaughan GK Andrew D'Souza couldn't hold, but the winger was signalled as offside in the move. Azzurri kept their eye on the prize though, with Ornoch chipping Sidhu into an open net, Gertiesingh sinking a twenty-five yard stinger, and sub Daniel Gogarty finishing a breakaway - all before the eighty-fifth minute. Vaughan's victory puts them clear by one point at the top of the table over Toronto FC Academy and Sigma FC, but TFCA hold the slight advantage with one game in hand. Azzurri play Thurs Aug 27 vs. ANB @ the Ontario Soccer Centre, 9 p.m. kickoff, while Clippers have until Sept 7 before travelling to TFCA's Kia Training ground for a 1 p.m. kickoff.